One of the features of iPad, and indeed of all iDevices, is portability. While I believe kids under five are best engaged in real world creative play and sharing songs, books and games with other kids and parents, I also can see the benefit of having quality book and other apps loaded onto an object that is incredibly handy for Those Times. You know the times? Waiting in a queue, or at the doctor's surgery, some time when kids need to be entertained with something not mindless. Puzzle Farm, by Eggroll Games, doesn't replace the joy and learning opportunities when sharing a family jigsaw puzzle in real life. But it's a simple digital puzzle game where young kids only need to tap and drag parts of pictures from a cloud to a scene below. The scene has a matching shaped cork board piece, just waiting for a child to fill it with a puzzle piece. Some pieces even have a jigsaw-shaped nub that slots into its respective waiting shape, a good introduction to real jigsaw puzzles. 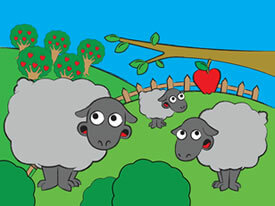 Once a puzzle is finished, kids can close it (a big X) to be taken to the main menu of 10 farmyard themed puzzles. I like that the puzzles are not daunting because not all the missing parts are shown at first, more arise as the puzzle is successfully completed. In fact, the game developers have succeeded in keeping possible confusion to a minimum. Pre-schoolers only have to drag the puzzle piece looking for a home fairly close to the cork board home before the piece springs into it - nice for kids who don't yet have manual dexterity. Apart from the entertainment/baby-sitting possibility I mentioned in my introduction above, Puzzle Farm would also make a useful activity to share with little ones. You could discuss the farm scenes, and animal names and noises - the animals in the game will make their own noises when you touch them. Why not make a silly game of it by trying to move incorrect pieces to a home? The piece just won't fit, but youngsters will have a wonderful time setting you straight! Read my other iPad reviews.